Furry Kids Can Sit on Santa’s Lap Too! Get a photo of you and your pet with Santa, and help dog rescue efforts at the same time. 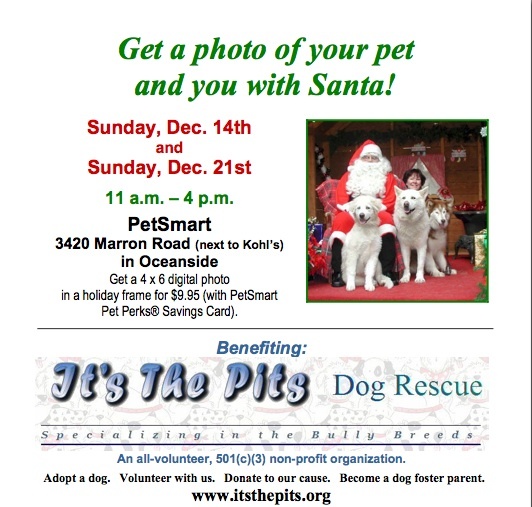 Sundaty December 14th and December 21st from 11am-4pm PetSmart (3420 Marron Rd. Next to Kohl’s) is hosting pet photos with Santa. Fire Mountain’s own Jay Scrivener will be playing Santa, so don’t miss it! Proceeds Benefit ‘It’s the Pits’ Dog Rescue. Visit www.itsthepits.org to adopt, volunteer, or donate.